Last Port of Call for the U.S. Merchant Marine? Part II in a two-part series, continued from the January 2017 edition of Maritime Reporter & Engineering News. Read Part I here. 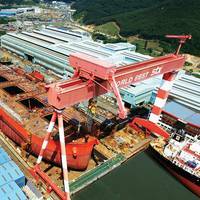 If reliance on the foreign commercial market is risky because of uncertain reliability, then what of U.S. Government ownership of a fleet of vessels? That has also been on the menu since the early 20th century. President Woodrow Wilson proposed in September 1914 that the U.S. Government acquire commercial cargo vessels. Congress disagreed, which delayed enactment of the President’s proposal until the Shipping Act, 1916. 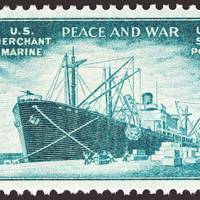 A compromise was struck to permit U.S. Government ownership as a war time measure – but all vessels so acquired had to be sold to private owners within five years of the end of the war. Last Port of Call for the US Merchant Marine? North Korea has lost contact with one of its submarines off the east coast of the country, CNN reports citing US officials. The U.S. is unsure whether the missing vessel is adrift at sea or has sunk, officials said. US spy satellites, aircraft and ships observed as the North Korean navy searched for the missing submarine for several days, the officials said. The United States is unaware of the submarine’s current whereabouts. CNN cited three unidentified U.S. officials saying that U.S.
China will be able to project "substantial offensive military power" from artificial islands it has built in the South China Sea's disputed Spratly Islands within months, the director of U.S. national intelligence said. In a Feb. 23 letter to John McCain, chair of the U.S. "Based on the pace and scope of construction at these outposts, China will be able to deploy a range of offensive and defensive military capabilities and support increased PLAN and CCG presence beginning in 2016," Clapper said in the letter released this week, using acronyms for the Chinese navy and coastguard. "Once these facilities are completed by the end of 2016 or early 2017, China will have significant capacity to quickly project substantial offensive military power to the region," Clapper added. The U.S. Coast Guard’s “number one priority is the offshore patrol cutter,” the service’s commandant told the House Appropriations Homeland Security Subcommittee Thursday, reports U.S. Naval Institute. The service will be looking again at its force-mix analysis, taking into account the money appropriated for a ninth national security cutter for this fiscal year, Adm. Paul Zukunft said. He said he had “the utmost confidence” the Coast Guard will down-select to one shipbuilder this year for the offshore patrol cutter. Lockheed Martin Corp on Friday welcomed the U.S. Navy's decision to use Lockheed's integrated combat system for future frigate-class ships to be built beginning in fiscal 2019, saying it would allow greater commonality across the entire Navy fleet. 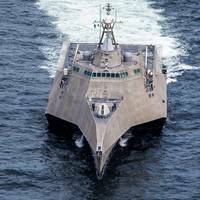 "It's great news," Joe North, vice president of Littoral Ships and Systems at Lockheed, told Reuters in a telephone interview. Neither the Navy nor Lockheed provided an estimate for the value of the combat system, but North said each system accounted for less than 10 percent of the cost of the ship. 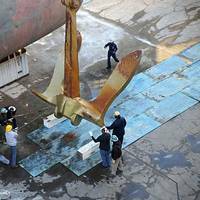 Russia Builds Nuclear Submarine "Arkhangelsk"
Russia’s Sevmash shipyard will hold a groundbreaking ceremony for its next generation Project fifth Yasen-M multirole nuclear submarine, the Arkhangelsk, on March 19. The Yasen-class subs are touted as the most advanced nuclear-powered multipurpose underwater craft in the Russian Navy. According to local media reports, the Navy Commander Admiral Viktor Chirkov has ordered that the submarine be named Arkhangelsk. This missile carrier will become the fifth Yasen Project multirole nuclear submarine, developed by St. Petersburg's Malakhit naval design bureau. 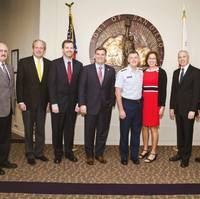 Admiral Paul Zukunft, Commandant of the United States Coast Guard, visited the Port of San Diego’s administrative offices on February 12. The Commandant was in town to participate in the 2015 Armed Forces Communications & Electronics Association /U.S. Naval Institute Conference held at the San Diego Convention Center. During his visit to the port, the Commandant participated in a briefing that included Dan Malcolm, Chairman of the Board of Port Commissioners; Acting President and CEO John Bolduc; Acting Chief of Harbor Police Mark Stainbrook and other senior Port staff members. A French frigate has entered the Black Sea, growing the number of NATO surface warships in the region to three, according to a U.S. Naval Institute (USNI) news report citing a ship spotting blog and Russian press reports. Surcouf (F711), a La Fayette-class frigate was spotted by amateur photographers crossing the Bosporus strait on Wednesday joining French signals intelligence ship Dupuy de Lôme (A759) and U.S. guided missile cruiser USS Vella Gulf (CG-72) – both which entered the region earlier this month. Former USCG Admiral Thad Allen is a transformational leader in the history of the service, a rock through thick and thin. Today he talks about resource allocation, risk management and homeland security. 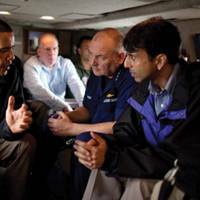 As part of Booz Allen Hamilton’s Justice and Homeland Security business group, Executive Vice President and former U.S. Coast Guard Admiral Thad Allen leads the development of thought leadership and client engagements regarding the future direction of law enforcement and homeland security. The Coast Guard is under pressure to either pare its mission mix or downscale what it does. The last 12 months has been one for the books ... or the trash. There was no shortage of government inducements to turn the lackluster tide in 2012—stimulus spending in China and Japan, quantitative easing by the U.S. Federal Reserve, and multiple actions by the European Central Bank to strengthen the Eurozone. But as the year evolved, weak macroeconomic fundamentals decisively trumped monetary policy initiatives and continued their choke on global commerce, hence the maritime sector. Can Google Track Warships Better than DoD? No way, says Guy Thomas, a man who’s in a position to know because he designed the satellite on which the information giant is renting space for its latest venture — a satellite that uses the same technology the Navy and the Coast Guard use. “Anybody driving along the shore with a pair of binoculars can see that destroyer out there. That’s the only time those ships have AIS on,” said Thomas, the Coast Guard’s science and technology adviser for maritime domain awareness. The controversy over AIS popped up after Michael Jones, chief technology advocate for Google Ventures, said in a May 17 speech to the U.S. Naval Institute’s annual Joint Warfighting Conference that his company was developing a system to track ships at sea globally — including naval vessels. "Until the Sea Shall Free Them," an account of the sinking of the SS Marine Electric in 1983 and the rescue of some of its crew, is back in print after Blue Jacket press and the Naval Institute rolled press on a second printing. The book, used by maritime academies and USCG safety instructors, tells the story of how more than 30 men went into the cold waters off Virginia and how only three came back. The three men, lead by Captain Robert M. Cusick, then battled against great odds to reform the industry. They eventually succeeded with the help of Coast Guard Captain Domenic A. Calicchio. 1884 - Department of the Navy establishes the Naval War College at Newport, RI (General Order 325). 1940 - Fourth group of 8 U.S. destroyers involved in Destroyers for Bases Deal are turned over to British authorities at Halifax, Canada. 1943 - In night Battle of Vella Lavella, 3 U.S. 1958 - USS Seawolf (SSN-575) completes record submerged run of 60 days, logging over 13,700 nautical miles. 1997 - NASA Astronaut CDR Wendy B. Lawrence, USN returns from mission of STS-86: Shuttle -Mir 7 when Atlantis docked with Mir Space Station. The mission began on 25 September. 1864 - USS Washusett captures Confederate raider CSS Florida in harbor of Bahia, Brazil. 1924 - Rigid airship Shenandoah commences transcontinental flight. On July 27, 2011, the U.S. Naval Institute (USNI) begins an important new chapter with the appointment of Vice Admiral Peter H. Daly, U.S. Navy (Ret.) as the professional society’s Chief Executive Officer. Daly served from August 2008 until June 2011 as Deputy Commander and Chief of Staff, U.S. Fleet Forces Command. He brings more than 30 years experience as a commissioned naval officer, to include command of the destroyer USS Russell (DDG 59); Commander, Destroyer Squadron 31; and Commander, Carrier Strike Group 11. He has also served as Deputy for Resources and Acquisition (J-8), Office, Chairman of the Joint Chiefs of Staff; and as Senior Military Assistant to the Secretary of the Navy. Austal USA is delighted to announce the employment of Dr. Craig Hooper as Vice President of Sales, Marketing and External Affairs. Dr. Hooper comes to us as the publisher of NextNavy.com, a widely-read national security-oriented website. He has a PhD from Harvard University and is the co-founder of New Pacific Institute, a national security think-tank. His experience also includes work as a lecturer at the Naval Postgraduate School, School of International Graduate Studies, Department of National Security Affairs. He is the founding contributor to the U.S. Naval Institute Blog on naval affairs and has published papers for leading defense publications to include: Proceedings of the U.S. Naval Institute, National Defense Magazine, and Naval War College Review. From the Navy News Service 1873 - Lt. Charles Belknap calls a meeting at the to establish the U.S. Naval Institute for the purpose of disseminating scientific and professional knowledge throughout the Navy. 1942 - The first three schools for enlisted WAVES open in , (yeoman); , (storekeepers); and (radiomen). 1945 - A parade in honors Fleet Adm. Chester W. Nimitz and 13 other Medal of Honor recipients. 1961 - USS Princeton (LPH 5) rescues 74 survivors of two shipwrecks ( lines Pioneer Muse and SS Shiek) from the . By Mass Communication Specialist 2nd Class (SW) Jennifer S. Top leaders from the military, government and industry gathered at the San Diego Convention Center Feb. 5-7, for the West 2008 conference, co-sponsored by The Armed Forces Communications and Electronics Association and the U.S. Naval Institute. The conference themed "U.S. at a Crossroads: Where to - and How - After Iraq?" featured discussions on pressing issues in the military services and how industry can help solve them. Former Chairman of the Joint Chiefs of Staff, Marine Corps Gen. Peter Pace gave the opening remarks and spoke of protecting the Internet and the importance of military, government and industry to work together. Northrop Grumman Corporation, a co-builder of the U.S. Navy's Arleigh Burke Aegis destroyers, has committed $175,000 over five years to sponsor the U.S. Naval Institute's Arleigh Burke Essay Contest. The announcement commemorates Adm. Burke's 100th birthday on October 19. The Naval Institute's most prestigious essay contest is open to all; for details, visit www.navalinstitute.org. The top three essayists receive $3,000, $2,000 and $1,000, accompanied by gold, silver and bronze medals, respectively. The top-prize winner also receives a life membership in the Naval Institute. The three winning essays will be published in the May 2002 issue of Proceedings. Essays must be postmarked on or before December 1, 2001.